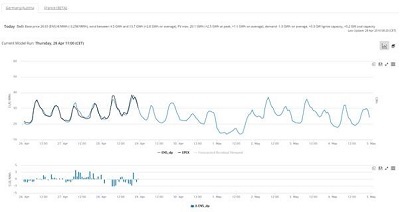 The ICIS price forecasts provide the highest accuracy by combining deep market knowledge with advanced quantitative modelling techniques. Enhance your trading and optimisation results with forecasts that consistently beat* the market. Watch this short video to find out more about the ICIS Spot Price GB Power Forecast. Highly accurate price forecasts for portfolio managers, traders and analysts operating in the GB day-ahead and intraday power market. The ICIS Spot Price Forecast GB Power offers power professionals a superior tool for portfolio optimization and dispatch tasks as well as for power traders and analysts that want to beat* the market. The ICIS Spot Price Forecast GB Power takes into account available capacities, fuel prices, weather effects on demand and renewables supply and other factors. The forecast is for the expected value of the hours (half-hours), and can thus be used in the bidding strategy of a power market participant to avoid unwarrantedly high (or low) prices in the morning auction. In the past, it has performed very well and can thus be an important tool to help you minimize your short-term power costs / maximize revenues. Why use ICIS Spot Price Forecast GB Power? Ensure you have the best quality: multiple daily quality checks and continuously reviewed modelling techniques, inputs and weightings. Besides the price forecast, customers can also access demand, wind and solar forecasts used as inputs to our price modelling in the ICIS Power Analytics Platform. The ICIS German Power Spot Price forecast is the preferred option of many power professionals for optimization and dispatch tasks as well as for power traders and analysts that want to beat* the market. Why use ICIS Spot Price Forecast for German Power? The quality of the ICIS Price Forecast for the German Intraday Auction, measured in MAE (mean absolute error), is outstanding. In 2016 the ICIS forecast achieved an MAE of only 3.13€/ MWh on the extremely volatile 15-minutes prices. 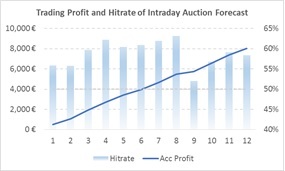 Why use the ICIS Intraday Auction Forecast? Higher solar production has offset the daily price minimum from the demand minimum, profile values have therefore changed significantly. This trend will continue in coming years. Price forward curve methodologyFor these reasons, the ICIS HPFC considers changes in renewable and conventional capacity, weather risks and the resulting effect on price shapes. ICIS generates hundreds of possible capacity and weather scenarios around base case assumptions and derives hourly shapes using the ICIS spot price forecasting model. All hourly shapes are combined to derive the base HPFC, which is arbitrage free to ICIS price assessments. Why use the ICIS Hourly Price Forward Curve? 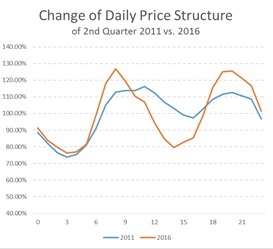 * The ICIS spot price forecast was directionally correct in 55% (2015) and 54% (2016) of hours, and in 59% of 15 minutes (2016). ICIS does not recommend trading strategies, but provides data services and analysis. ICIS provides independent and robust pricing information for the global energy markets. Our comprehensive reports cover key markets including electricity, gas, liquefied natural gas (LNG), carbon-emissions, renewable energy, coal and crude oil. The team of market experts and editors follow the energy markets closely and report on prices, developments and news as they happen. Our reports are valued by the financial community, producers, buyers and suppliers in the energy industry. They rely on ICIS reports for independent pricing data that helps to strengthen their position in price negotiations, understand price movements and reasons behind them and to analyse the supply/demand dynamics of the global energy markets. What's included in the price forecast?